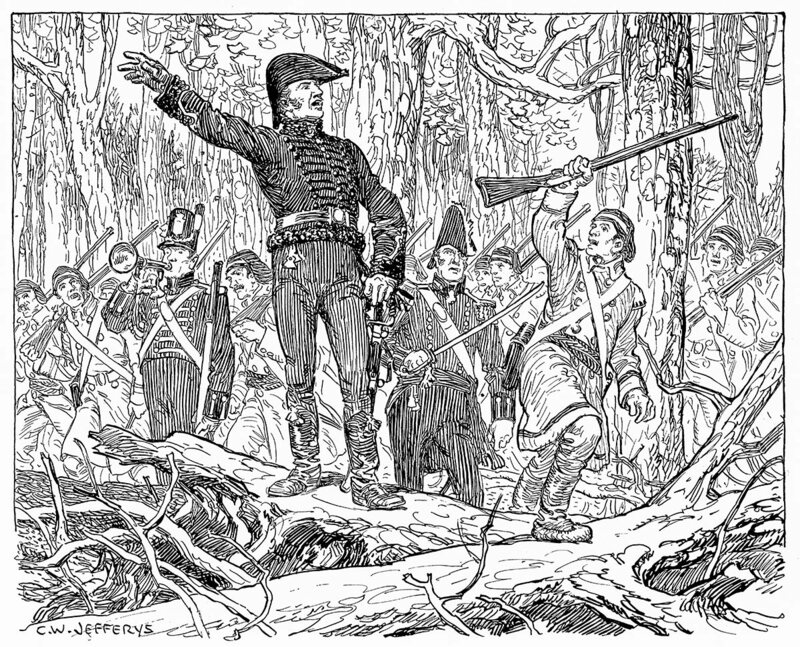 As the night attack at Stoney Creek stemmed the invasion of Upper Canada in the early summer of 1813, so the fight in the woods of Chateauguay checked the expedition against Lower Canada in the fall of the same year. Seven thousand five hundred men, under General Hampton were advancing from Lake Champlain, while about as many under General Wilkinson were descending the St. Lawrence to join in an attack upon Montreal. Not half their number could be collected for its defence. Much of the district was then heavily wooded. A few rough roads led through the forests, and these were now blocked by trees cut down by French-Canadian lumbermen to impede the progress of the invaders, while the fords of the streams were protected by breastworks of logs. Indians and habitant scouts, militia and regular British soldiers watched all through the woods. The neighbourhood was in charge of Colonel de Salaberry, a well-trained and active French-Canadian officer, who had served many years in the British army, and who knew the country thoroughly. On Hampton's approach de Salaberry chose a strong position on the Chateauguay River, which flows into the St. Lawrence a few miles above Montreal. Here, near the present-day village of Bryson, the famous fight took place. Hampton marched down the left bank of the river by a forest road which led through de Salaberry's position. On the evening of the 25th of October, the Americans came in sight of the little force of less than five hundred men that barred their way. Hampton halted and planned to attack de Salaberry next day. During the night fifteen hundred Americans under Colonel Purdy crossed the river and marched to a ford further down stream. Here they were to recross the river and attack de Salaberry's rear, while the main body of the Americans engaged the British front. In the dark woods Purdy's men lost their way, and by daylight were still far from the ford. While the Americans were floundering aimlessly in the darkness, a reinforcement was hurrying towards de Salaberry. From far up the St. Lawrence, two hundred miles away. "Red George" Macdonnell, of Glengarry, and three companies of picked French-Canadian militiamen were on the way. They ran the rapids in bateaux, rowed all day against the wind on Lake St. Francis, landed and, marching all night, reached the fighting ground an hour before dawn. They were sent at once to man the defences at the ford, toward which Purdy's detachment was groping its way. Early in the morning, the main body of the Americans pushed forward until they reached the abattis of felled trees which protected the British front. Here they were received by volleys of musketry, while scattered Indians fired at them from ambush all through the woods. Hampton halted to wait for news of the attack on the rear. Purdy's men encountered a body of French-Canadians, who after fighting stubbornly, gave way before them. The Americans pressed forward in pursuit to the ford, which they expected to find undefended. But now Macdonnell's redcoats crowded the breastwork and all through the autumn woods shrilled the Indian warwhoops, while from every direction by de Salaberry's orders, bugles sounded the advance of cheering men, until it seemed as though the Americans were surrounded on all sides by overwhelming numbers. Panic seized Purdy's men, and they fled back in confusion upon the main body, which had made no progress. Hampton ceased his attack, collected the fugitives, and withdrew from what seemed a dangerous position. De Salaberry, by his bold resistance, his clever strategy, and the skilful disposition of his handful of men, had completely outwitted and outfought his opponents. The story goes that de Salaberry wittily declared that he had gained the victory mounted on a wooden horse, because he had climbed on the stump of a fallen tree to direct the fight. Hampton lingered ineffectively in the neighbourhood for a couple of weeks, and then led his troops back to the United States. Wilkinson's expedition fared no better. He was defeated at Chrysler's Farm on the 11th of November, and the news of Hampton's failure and the lateness of the season decided him to give up the attempt on Montreal. He, too, retreated across the border. Canada was safe for another year. In the picture, de Salaberry wears the dark green uniform of an officer of a rifle corps; a short jacket braided across the breast, with an edging of black fur at collar and cuffs, tight breeches, and knee boots with tassels at their tops. His sword is curved, as was the regulation then for officers of rifle or light infantry regiments. The officer standing beside him carries a straight sword, and is dressed in a scarlet red coat, with a crimson sash, which shows that he belongs to a line regiment. Some of the French-Canadian militia wore red coats like those of British regulars; but others were dressed in frock coats or capotes of grey homespun, with sashes of the famous arrow pattern, woven in red, blue and yellow, red toques or woollen bonnets, and boots of soft leather, with soles like moccasins.